One morning Jenny McCarthy was having a cup of coffee when she sensed something was wrong. She ran into her two-year-old son Evan?s room and found him having a seizure. Doctor after doctor misdiagnosed Evan until?after many harrowing, life-threatening episodes?one good doctor discovered that Evan is autistic. 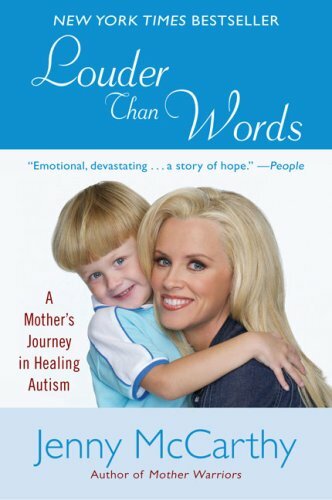 With a foreword from Dr. David Feinberg, medical director of the Resnick Neuro-psychiatric Hospital at UCLA, and an introduction by Jerry J. Kartzinel, a top pediatric autism specialist, Louder Than Words follows Jenny as she discovered an intense combination of behavioral therapy, diet, and supplements that became the key to saving Evan from autism. Her story sheds much-needed light on autism through her own heartbreak, struggle, and ultimately hopeful example of how a parent can shape a child?s life and happiness.